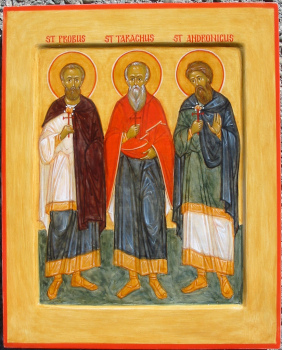 The Holy Martyrs Probus, Tarachus, and Andronicus suffered for Christ in the year 304 in the city of Cilician Tarsus. To the proposal of the pagans to offer sacrifice to the idols, the old soldier Tarachus replied that he offered sacrifice to the One, True God in a pure heart. Seeing the firmness of the saints in confessing the true faith, the proconsul gave them over to torture. The tormentors refined their tortures, such as their rage could invent, and then they tore the bodies of the saints apart. Christians secretly took up the remains of the saints and buried them.